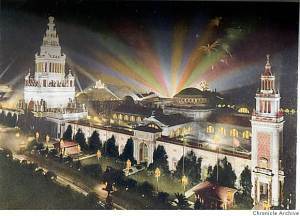 In 1915 San Francisco was host to the Panama-Pacific International Exposition. This year was specifically chosen by the city to celebrate 2 significant events: The opening of the Panama Canal and the resurrection of the city out of the ashes of the great earthquake. San Francisco was teeming with pride and enthusiasm and wanted to share that with the entire world and specifically the Pacific Rim region.